Only issue I had is that it was the wrong color but I don’t want to go through the hassle of sending it back and waiting for a new one. I wanted the navy blue one and I must have hit the wrong color or something so I’m pretty disappointed because I don’t know what happened that I got the wrong one but other then that I think I’m gonna really love it, I like the feel and the softness. Add all-season warmth and soft texture to your bedding with this down-alternative comforter. This lightweight comforter is available in a variety of colors to suit your style, while the microfiber material and filling make it easy to clean. I miss the days of the old fashioned heavy thick comforter. I was a little disappointed at first to realize this wasn't as thick as I'd wanted. However, that disappointment went away immediately. Despite being thinner, it has that weighted yet breathable feel that I love. In the 90+ degree weather it is still cool enough that you're not roasting, but at the same time if you're like me and keep your AC set on "antartic" it keeps you warm enough that you're comfortable. I was very please by the weight too, it's heavy, but not so much you can't move, and I've always been that person that wants to just burrow myself in. The perfect comforter, say no more! I ended up getting four of these in various sizes. The colors are bright and vibrant and have held up after several washings. The comforters are light to carry in either the Queen size or the King. They are warm enough for cold evenings but surprisingly not too hot on warm evenings. The price is right, and as my review title says, it is truly "the perfect comforter! Say no more!" Highly recommended. The only small complaint is that I have a King size bed and although the King comforter does a decent job of covering it, it would be nice if it came in a California king to really drape over all four sides of the bed. Since I am only using it as a cover and not as a primary layer for the bed , this is not an issue. So soft and warm, even though it's lightweight! My only complaint is that it runs a little small. I ordered a king for our queen bed because I wanted it to hang far over the edges, but there's only about 6 inches on either side. This is a very soft cover and the colors are true. It is to small for my bed and doesn’t hang over long enough. What can you get for a king because they do make x-large. Don't let the price fool you. I have gone through the "real down" feather comforters that were much more expensive than this, but you couldn't buy this one away from me. I got the coral and the color is bright and truly coral. This comforter is SO soft and fluffy, comfortable and warm. I live in Arizona and this comforter is really a year around comfortable. Confusing right? It's cool and light in the summer yet warm enough for the winter. Can't explain it, and not going to try. What I am going to do is get more for the other beds. I ordered 2 of these comforters: one turquoise and one coral. I did not expect to receive such beautiful, warm, thick, soft and brilliantly colored comforters that are true to color as shown online. Exceptional quality for a very low price. I highly recommend this product. 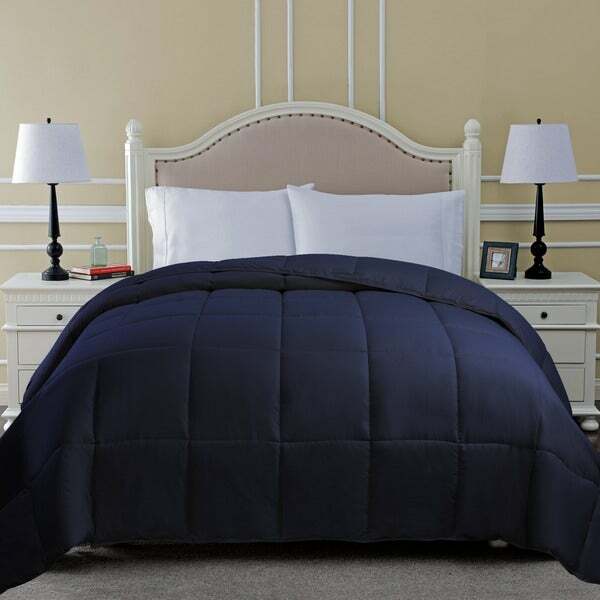 The Superior Hypoallergenic Down Alternative Classic Comforter is so plush and comfy; it feels like sleeping on clouds. i purchased this comforter in Navy for my son's room at school. He loves the color. Fits his queen bed nicely. He says its warm and cozy. Does not feel cheap. Fabric is soft. This is a nice lightweight alternative comforter. I ordered the king size but noticed that it is a little short but decided to keep it because its really soft and comfortable. The king size would probably fit better on a queen size bed. A great comforter. These are very nice and comfortable for anyone with allergies to dust or dustmites. I bought 3 sets of these without any problems. I highly recommend these to anyone for the best price here on Overstock.Com bestest sales. You won't be sorry you did. This was true to color and the perfect weight! This has a nice feel and is quite warm. Perfect for someone who is allergic to down. My comforter arrived in a timely manner and I put it into service immediately. To say I was satisfied is an understatement..Iive in the mountains of Arizona above 8000 ft and brisk is my domain. The comforter does it's duty and am very satisfied..
Much thinner than I was expecting, but keeps me warm at night. My room gets very cold and I feel completely comfortable with this. So warm and easy to care for. We were looking for something to replace our deteriorating old one. After searching around, it looks good for us. When we had it, It is exactly what we are hoping for. Very comfortable and light enough. we believe we mad a right choice to pick this up. Very thin. This is great for an extra comforter, but not nearly fluffy enough to fill my duvet. LOVE LOVE LOVE!! Super soft, light weight, but still heavy enough to stay warm! Very soft and great quality. This is a good quality comforter that is not too heavy. It washes well and I’ve used it as a duvet insert for a king-sized cover. The filling has stayed put after washing—recommend. "Some duvets don’t fit a cal king or king correctly, does this hang over the sides and corners of a king? Or does it just cover the top of the mattress?" "Is this comforter flame resistant?" "The silver color looks to be on a purple cast from the picture. Does anyone own it? Does it match the color on the picture?" "looking for a comforter that is comfy but fairly lightweight and compact for backpacking without spending a fortune. will this fold/roll down fairly small?" "does it have the tabs in the corner to tie a duvet cover to the duvet?" I'm buying it for a son who likes the weight of a comforter but doesn't want to be too hot. Also the hypoallergenic will be good because of allergies.